Running with Zithers........: 90 years young and Running with Zithers! 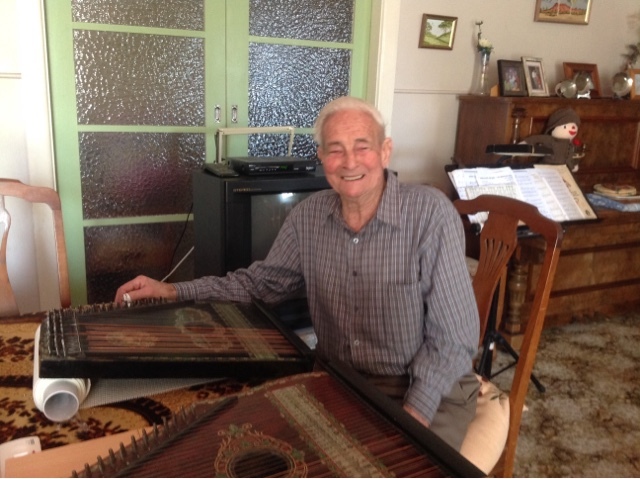 90 years young and Running with Zithers! Meet Stan, the new owner of the unique 'Edelweiss' zither featured in the last post. With a good clean and a couple of string replacements, this zither was brought back to it's former glory. Stan is living proof that music-making keeps you vital and I hope that my zither play will have me looking this good when I am 90. To explore the wonderful world of chord zithers, come and see us at this year's Birregurra Festival.